Welcome to Tenley's Aquatics! Please complete the following registration form, filling in ALL required fields. Online enrollment is currently only available for private lessons. Swimmers of similar age and ability may join to form semi-private and group lessons. Once you have registered for a class, please contact us to open the class up to the other students in your desired group. Please click on the "Select Class" button below, then choose the class. Classes can be sorted by SWIMESTERS depending on your desired days and times. PLEASE NOTE: All online class enrollments must be approved by our staff to ensure the appropriate class is selected. We will contact you once your enrollment is confirmed. Swimming lessons are in no way associated with the Facility where they are located. Any comments, questions, or concerns should be brought to the attention of Tenley Smith, President of Tenley's Aquatics, Inc., as the Facility has no control over the content of the lessons or the style of teaching. 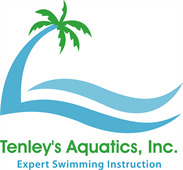 Every effort will be made to provide a safe swim lesson experience; However, Tenley's Aquatics, Inc., the Instructor(s), and the Facility are not responsible for accidents or injury occurring on the property of the Facility. 1.) Follow all rules and regulations at the Facility, whether posted, written, spoken, or implied. 2.) Guardians, friends, or relatives are welcome to stay during class and observe lessons in designated area. 3.) All persons not in the lesson must remain at least 3 feet away from the edge of the pool. 4.) Under no circumstances, should children who are observing be left unattended. 5.) Participants should use the toilet before class, if possible. 6.) Do not wander around the Facility unless you have personal business there. 7.) Long hair should be tied securely away from face and all jewelry left at home. 8.) It is preferred and strongly recommended that goggles and nose plugs be left at home. 9.) Floaties, armbands, or water wings are not allowed in class. They are discouraged even when practicing. 10.) Participants should practice at least a few times each week to be comfortable and familiar with the water. IMPORTANT: All swim lessons that are cancelled due to weather-related conditions will be rescheduled and made up at a later date. If the Instructor must cancel a class, the Instructor will call or text the Participant as soon as possible, and the class will be made up at a later date/time. If the Participant needs to cancel a class, the Guardian/Participant will call or text the Instructor at least 1 hour prior to the starting time of the class. A Participant of a private lesson may cancel a lesson and make it up, provided that adequate advance notice is given to the Instructor. Participants of a semi-private lesson may do likewise, provided BOTH Participants cancel the lesson. If a Participant misses a group lesson, there is no opportunity for a make-up lesson, unless the entire group cancels. No refunds are given after the third class/lesson. Cancellations without proper notification will not be made up. (See Section 5 - Cancellations and Refunds.) Any makeup lessons due to the participant after the "class end date" may be made up, but there are no guarantees that the make-up lesson will be at the same date and time as the regularly scheduled lessons. •	Completion of the last class period shall result in the termination of this contract. •	Failure to pay the total fee on or before the first class may result in the termination of this contract. •	Failure to comply with the above regulations shall result in the termination of this contract without refund. Should the USPS address of the private or community pool being used for swim lessons fall outside of Tenley's Aquatics area of service (zip codes 34117, 34119, 34120 and 34142) a travel fee may apply. Upon registration, this fee will be calculated and communicated with you before being added to the student's account.